The rhetorical zigzags left one senator lamenting a “walk-back of the walk-back” that was, she said, “dizzying.” Even Putin walked back. Here's a look at what they all said after Monday’s summit in Helsinki. 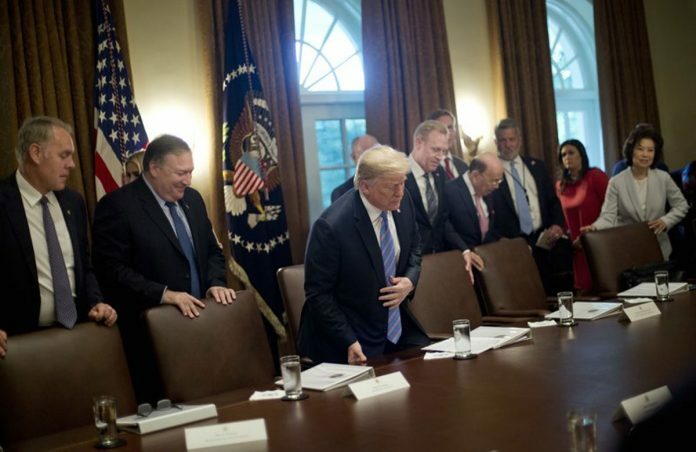 This was the week when “would” turned into “wouldn’t” and “no” meant “yes,” as President Donald Trump and his top aides tried to walk back several of his comments on Russia and the Federal Reserve. Trump was asked at the end of Monday’s summit in Helsinki with Russian President Vladimir Putin: “Who do you believe” — U.S. intelligence, which accuses Russia of election meddling, or Putin, who denies it? Facing intense blowback for siding with Russia, Trump dug in and tweeted that “Fake News” was to blame for mischaracterizing the summit. During the same press conference, Trump praised Putin’s “incredible offer” of a deal to swap interrogations. Putin pitched the idea that the U.S. could question the 12 Russian military officials indicted for hacking into the Democratic presidential campaign. In exchange, he said, Russian authorities could interview several Americans the Kremlin accuses of unspecified crimes. “I think that’s an incredible offer. OK?” Trump said. The idea landed with a thud among officials back in the U.S.
“Hopefully President Putin will have the 12 identified Russians come to the United States to prove their innocence or guilt,” she added. There was more verbal drama at Wednesday’s Cabinet meeting, when Trump was asked by a reporter if Russia was still targeting the U.S.
“Thank you very much, no,” Trump said. The reporter asked again, and Trump said “no” again. “But can you just clarify, you don’t believe that to be the case?” the reporter asked a third time. Sanders later said his comment was misinterpreted. She said Trump was saying “no” to answering additional questions — although that didn’t appear to be the case because he elaborated on Russia. On Thursday, Trump said he was “not happy” that the Federal Reserve was raising interest rates, breaking with long-standing tradition at the White House of avoiding any influence on the U.S. central bank. “The president’s views on interest rates are well-known, and his comments today are a reiteration of those long held positions, and public comments,” Walters said in a statement. But that clarifying remark was washed away Friday when the president took to Twitter to press the Fed to change course. “The United States should not be penalized because we are doing so well. Tightening now hurts all that we have done,” Trump tweeted. Putin had his own walk-back. During the Monday press conference, he alleged that Bill Browder, an investor and Putin critic accused of financial crimes in Russia, contributed $400 million to Hillary Clinton’s presidential campaign. The notion of a $400 million donation to the Democrat’s campaign would be out of the question. On Tuesday, the Russian general prosecutor’s office said to little fanfare that Putin misspoke and meant $400,000. The watchdog site opensecrets.org shows Browder’s New York financial partners, Ziff Brothers Investments giving only $17,700 for Clinton’s election and less than $300,000 to the Democratic National Committee, as well as smaller amounts to other entities.